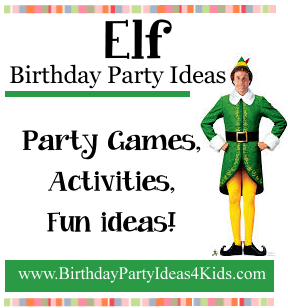 Fun Elf themed party games, activities and fun ideas for kids, tweens and teen parties for a Buddy the Elf themed birthday party. Scroll to the bottom of the page to see our 24 favorite Buddy the Elf quotations! Place six uncooked pieces of penne pasta near the edge of a table. Give the player an uncooked spaghetti noodle to hold in his/her mouth and use to try and pick up the penne noodles. This is much harder than it sounds! Use chopsticks to move gumdrops from one bowl to another. First player to transfer all their gumdrops wins! Players can only use their chopsticks - no hands. Teams can only use the icebergs given to them to get from one end of the room to the other. Teams use the iceberg	pieces to move by having players stand on the ice burgs all together. Then they take the back iceberg and hand it down the line to the front of the line and so on. If a player steps off the iceberg into the water they all go back and begin again. Tie a rope or string across the room in-between two chairs or other tall objects. Split all of the players into two teams and have them stand on the opposite side of the room. When the game starts, each player must pick up a candy cane with his/her mouth, run to the rope, and hang the candy cane on the rope without using his/her hands. The player then runs back so the next person in line can go. The team to hang all of their candy canes on the line and make it back first wins! 3 – 4 candy canes per team member. Give each player a candy cane to put in their mouth, with the curved side pointing down. The players then use their candy cane to pick up other candy canes that are lying on the table. Once a player has picked up a candy cane, he/she can put it in his/her pile. The player with the most candy canes in his/her pile after one minute wins! Punch a small hole in the bottom of each plastic cup and insert a candy cane halfway through the hole where the hook of the candy cane is on the outside of the bottom of the cup. Divide players into two teams. Each team gets 10 marshmallows. The object of the game is to transfer the marshmallows from one person to the next without using their hands. The first team that moves all 10 marshmallows down the line in their team wins! Have an adult dress up in a Santa suit or hire a professional party entertainer to play Santa for the party. Give each child a chance to sit on his lap and tell him what they would like for Christmas. This is also a great photo opportunity to take a picture and send it to the party guests later with a thank you card. Here are our favorite 24 Buddy the Elf quotes and sayings. Use them as fun signs around the party area or make a fill in the blank quiz for a fun icebreaker party game. 10. “You stink! You smell like beef and cheese, you don’t smell like Santa. 17. “You did it! Congratulations! World’s best cup of coffee! Great job, everybody! It’s great to be here.